The creation of a geometry model that approximates the shape of the actual physical problem is the first step before performing any kind of engineering analysis. AndTruss2D offers a built-in model creation system, but it is not quite sophisticated and it is more suitable for editing an existing model. Also, after trying out some CAD applications for smartphones and tablets I found out that they are less productive and intuitive than their desktop counterparts because of the limited screen sizes, and bescause touch input is not so accurate as mouse+keyboard. For these reasons AndTruss2D offers 20 truss templates that enable the user to set up a common truss model quickly. However, it is impossible to cover all possible truss geometries with just 20 templates. 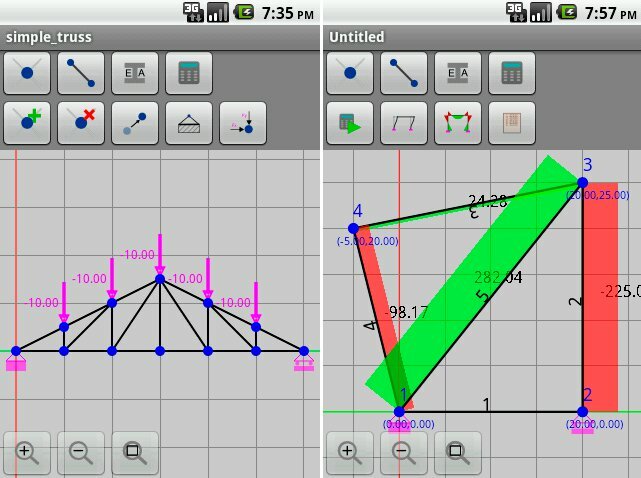 AndTruss2D is a useful application for engineers (civil engineers, mechanical engineers, architects etc) It is used for linear static analysis of plane trusses with the Finite Element Method. It provides an easy-to-use graphical user interface that enables the user to set up quickly the static model and view the results after the analysis process. * AndTruss2D download link provides freeware version of the software. 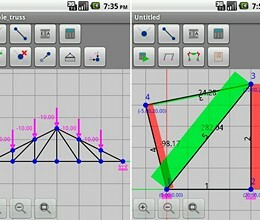 Calc4fem is the open source spreadsheet for plane frames, beams and trusses calculation. 2D Frame Analysis is a powerfull application which uses optimized finite elements (beam elements) in order to perform static analysis of beams, frames and trusses. AndTruss2D has been rated 1.0 out of 5 points. A total of 3 votes cast and 0 users reviewed the software.